Like most developers, I love finding tools that do my work for me and make me look good. And, like most developers, I am extremely wary of adding too much outside crap to a project which can make maintaining it a nightmare. You may end up not only maintaining your own code but someone else's code, or worse, not being able to update the project because a third-party control won't let you. The Ajax Toolkit has some great stuff that is very easy to use. It's from Microsoft so you can be pretty comfortable adding it to a project. Drag and Drop and off you go. But often things don't work out exactly as you would like. Deploying and debugging are not always easy. A viable alternative to the Ajax Toolkit is the jQuery UI. I was happy to see on the jQuery web site they have their own UI controls…very happy. If you are already using jQuery, you don't feel as if you are adding a third party component. And, it seems, Microsoft has 'adopted' jQuery. I decided to try out the DatePicker control, since picking a date is one of the most useful and common tasks a control can do. Downloading and installing the jQuery UI was no more difficult than downloading and installing jQuery itself. The download is customizable; you pick which components you want and which visual theme you want. Note: Other versions of the source code are available: non-minimized and documented versions. Note: jQuery code is usually so ugly its own mother would slap it. I strive for legibility and maintainability by NOT nesting and chaining functions and using a more 'traditional' C# style of coding. You can edit the text in the box by hand and the DatePicker control reads it. 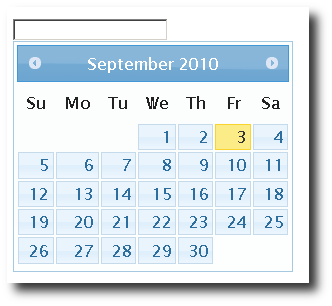 If the text isn't a valid date, the DatePicker control ignores it. Nice. It has a good solid feel. I know engineers shouldn't talk like that but…it has a good solid feel. Let's change the date format. Sadly, the date formatting codes are different than the .Net DateTime formatting codes (more on this later). I added a few more options just for fun. For numberOfMonths, you supply a two dimensional array: 3 by 4 would show an entire year. Why didn't I just chain the formatting code to the creation code? Why did I create a separate variable? 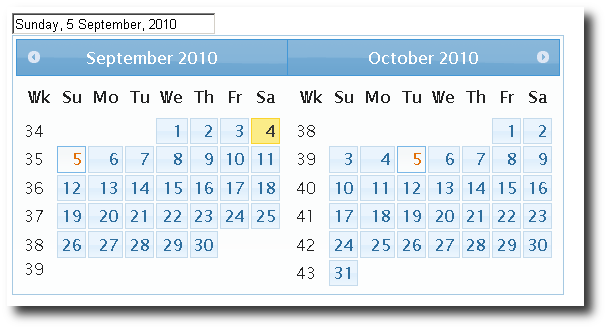 Debugging: If something goes wrong, I can tell if the problem is in the creation of the DatePicker or in the formatting of the DatePicker. Until you have to debug code, you don't know how valuable and useful this is. The local variable avoids a duplicate search operation. Why the weird code formatting when setting the options? I tried to make it as readable as possible. When there is more than one option, it is easier to read if each option is on a separate line. It's also easier to tell when the braces and parenthesis match up. Note: In the above image you can see a bug: The fifth day of both months is selected. I checked the website and it was already reported here: http://dev.jqueryui.com/ticket/5984. The posted workaround corrected the problem. It's pretty cool. But, the textbox is going to be sent back to the server and will need to be converted to a DateTime object. As mentioned earlier: .NET and jQuery use different formatting codes. In a real application, you'd want to centralize the format strings in one place so they are easy to maintain (by using constants or utility functions). Once you start playing with and using the jQuery UI components, you'll be hooked. By the way, I still use and appreciate the Ajax UpdatePanel in the Ajax Extensions toolbox. Although some treat it disdainfully, what you get, for what you pay, is a great bargain. Note: jQuery code is usually so ugly its own mother would slap it. I should have a another look at the latest version of jquery UI. I use jquery heaps, but had a bad experience 12 months ago when trying to use jquery ui for a simple animation and just got various bugs in different browsers. Funnily enough I found the animation framework that somes with the Ajax Control Toolkit worked perfectly in all browsers I tested it in, so I use a combination of Ajax Control Toolkit and also jquery core in my current projects. I just make sure to pack everything into a single download that is compressed so the client browser only does a single HTTP request to get all the various sripts (jquery included). Great article! I know I'm working on converting some fellow developers here to start using jQuery over the Toolkit for a lot of basic needs. I've also noticed that the jQuery scripts often run a lot faster than their Ajax Toolkit counterparts. +1 for the code formatting as well. I've been digging through a lot of online tutorials and finding the "chaining" syntax difficult to parse at times. Looking at it in the separated format is a lot better. Steve, thanks for writing this article. jQuery is becoming standard nowadays and I always prefer Client Side solutions instead of server side. For today it is the best decision to use jQueryUI with asp MVC framework. I don't believe in future of Ajax Toolkit at all, it's redundant. i tried your example and it works fine but when i use a masterpage datepicket on "slave" pages don't work. You should ask questions on the http://forums.asp.net/ site.